WASHINGTON — President Donald Trump is going after the "horror show" known as the diversity visa lottery program. His description of it is pure fiction. 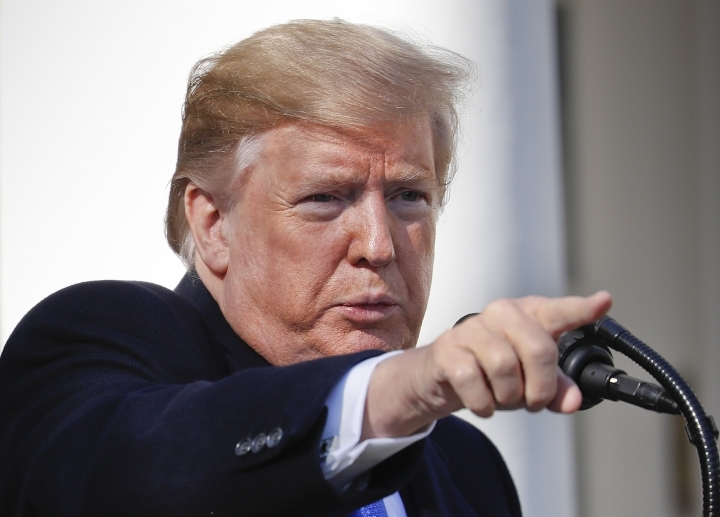 The president offered a multitude of fabrications and partial truths over the past week on the subject of immigration — both the legal and illegal varieties — as he declared a national emergency aimed at finding the money to build his border wall. He said drugs are flowing across the hinterlands from Mexico, not from border crossings, and suggested that the federal prison population is laden with hardened criminals who are in the U.S. illegally. Neither claim is substantiated. Along the way, the president took unearned credit for developments in the auto industry, health care for veterans and trade with China. TRUMP: "And then you have the lottery. It's a horror show, because when countries put people into the lottery, they're not putting you in; they're putting some very bad people in the lottery. It's common sense. If I ran a country, and if I have a lottery system of people going to the United States, I'm not going to put in my stars; I'm going to put in people I don't want." — Rose Garden remarks Friday. THE FACTS: That's completely false. He says this often anyway. The lottery program is run by the U.S. government, not foreign governments. Other countries do not get to sort through their populations looking for bad apples to put in for export to the U.S. Citizens of qualifying countries are the ones who decide to bid for visas under the program. The program requires applicants to have completed a high school education or have at least two years of experience in the last five years in a selection of fields identified by the Labor Department. Out of that pool of people from certain countries who meet those conditions, the State Department randomly selects a much smaller pool of winners. Not all winners will have visas ultimately approved, because they still must compete for a smaller number of slots by getting their applications in quickly. Those who are ultimately offered visas still need to go through background checks, like other immigrants. TRUMP: "I've built a lot of wall. I have a lot of money, and I've built a lot of wall." — Rose Garden remarks . 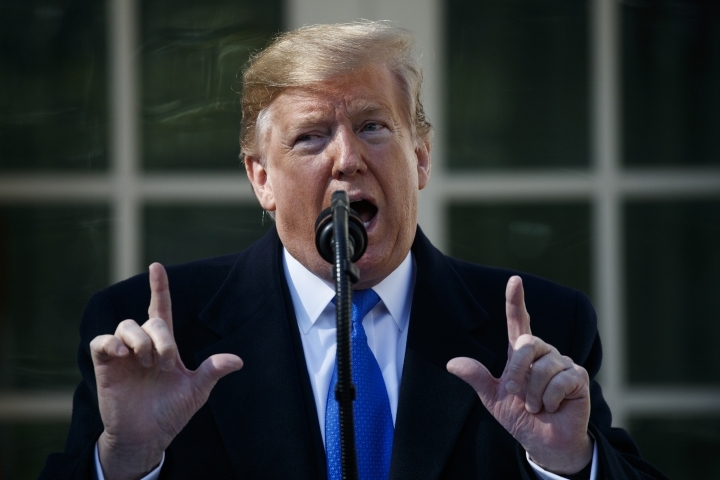 Trump often has often portrayed his wall, falsely, as largely complete, to a point where "Finish the wall" has become his rallying cry, replacing "Build the wall." That masks a distinct lack of progress in physically sealing the border — a frustration that is now prompting him to find money outside the normal channels of congressional appropriation. Trump inherited about 650 miles (1,050 km) of physical border barrier from previous administrations. TRUMP, on past presidents declaring national emergencies: "There's rarely been a problem. They sign it; nobody cares. I guess they weren't very exciting. But nobody cares. ... And the people that say we create precedent — well, what do you have? Fifty-six? There are a lot of times — well, that's creating precedent. And many of those are far less important than having a border." — Rose Garden remarks. TRUMP: "Billions of Dollars are being paid to the United States by China in the form of Trade Tariffs!" — tweet Saturday. TRUMP: "And a big majority of the big drugs — the big drug loads — don't go through ports of entry. They can't go through ports of entry. You can't take big loads because you have people — we have some very capable people; the Border Patrol, law enforcement — looking." — Rose Garden remarks. TRUMP: "We have tremendous amounts of drugs flowing into our country, much of it coming from the southern border. When you look and when you listen to politicians — in particular, certain Democrats — they say it all comes through the port of entry. It's wrong. It's wrong. It's just a lie. It's all a lie." — Rose Garden remarks. TRUMP: "Take a look at our federal prison population. See how many of them, percentage-wise, are illegal aliens. Just see. Go ahead and see." — Rose Garden remarks. SEN. DIANNE FEINSTEIN, Democrat of California: "Unauthorized border crossings are at their lowest levels in decades, about one-third of their peak levels two decades ago. If there were an emergency, the president wouldn't have waited two years to make this political decision." — tweet Thursday. CALIFORNIA GOV. 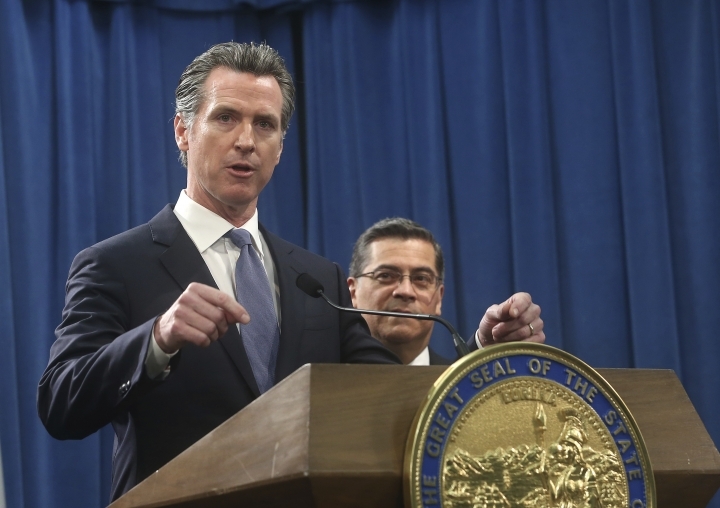 GAVIN NEWSOM: "We are currently experiencing the lowest number of (illegal) border crossings since 1971." — State of the State speech Tuesday. DEMOCRATIC SEN. AMY KLOBUCHAR, a 2020 presidential candidate, responding to reports she can be a tough boss: "I was teasing President Obama the other day. They have hired, the White House hired, over 20 of my staff members. You only have about 25 in a Senate office. And a number of them have come back to me when they were over there. So that's my story. I know I can be too tough sometimes. And I can push too hard, that's obvious. But a lot of it is because I have high expectations for myself, I have high expectations for the people that work with me." — interview with MSNBC on Feb. 11. 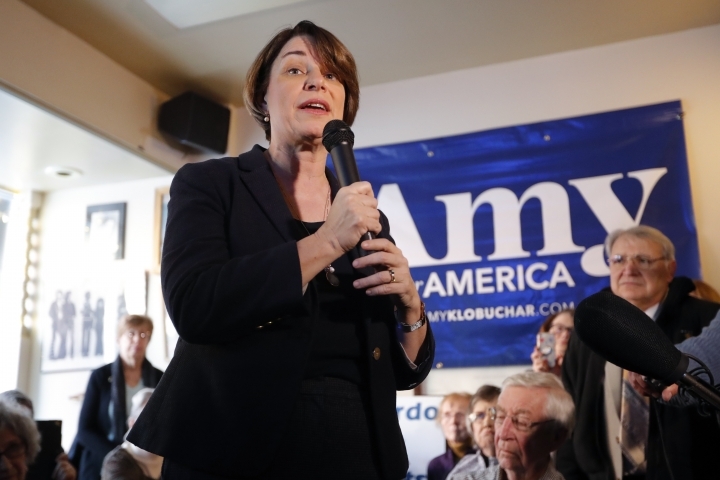 KLOBUCHAR CAMPAIGN: "She has many staff ... who have gone on to do amazing things, from working in the Obama Administration (over 20 of them) to running for office to even serving as the Agriculture Commissioner for Minnesota." — statement to news media this month. TRUMP: "A lot of car companies are coming back to the United States." — Cabinet meeting Tuesday. TRUMP: "We're most proud of the fact — you look at the car companies, they're moving back, they're going into Michigan, they're going into Pennsylvania, they're going back to Ohio, so many companies are coming back." — El Paso, Texas, rally on Feb. 11. TRUMP: "We have massive numbers of companies coming back into our country — car companies. We have seven car companies coming back in right now and there's going to be a lot more." — remarks to reporters Feb. 6. TRUMP: "Another one they said could never get passed, they have been trying to do it for 40 years, we passed VA Choice. Veterans Choice. ... VA Choice, they would wait on line for days and weeks, they couldn't see a doctor. Now, they go out, they have a choice. They get a private doctor, they have things taken care of, and we pay their bills." — El Paso rally. 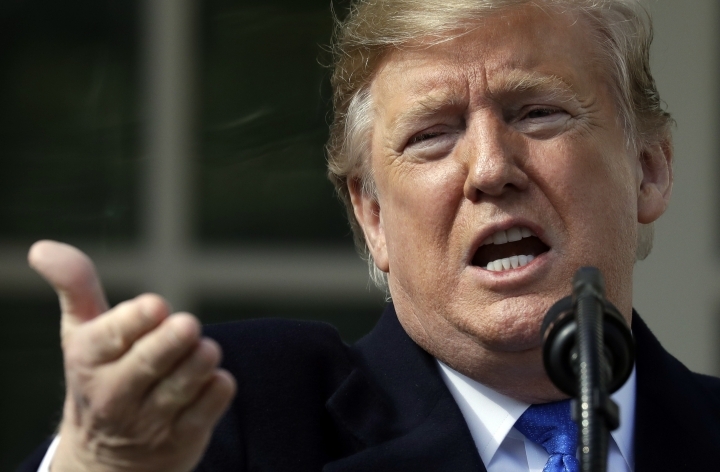 TRUMP, on the effects of the Green New Deal floated by some Democrats: "You're not allowed to own cows anymore." He added that the plan would "shut down American energy" and "a little thing called air travel." — El Paso rally. TRUMP, on the effect of a border wall on crime in El Paso: "When that wall went up, it's a whole different ball game. ... I don't care whether a mayor is a Republican or a Democrat. They're full of crap when they say it hasn't made a big difference. I heard the same thing from the fake news. They said, 'Oh crime, it actually stayed the same.' It didn't stay the same. It went way down. ... Thanks to a powerful border wall in El Paso, Texas, it's one of America's safest cities now." — El Paso rally. TRUMP, describing the crowd for a competing rally in El Paso, Texas, led by Beto O'Rourke, a potential 2020 Democratic presidential candidate: "He has 200 people, 300 people, not too good. ... That may be the end of his presidential bid." — El Paso rally. TRUMP: "Illegal immigration hurts all Americans, including millions of legal immigrants, by driving down wages, draining public resources and claiming countless innocent lives." — El Paso rally.